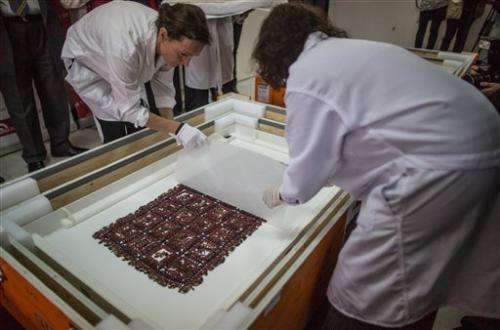 A rare and fragile pre-Incan funeral shroud was displayed to reporters Monday, part of the first batch of ancient Paracas textiles that Sweden is returning to Peru 80 years after they were smuggled out by a diplomat. The intricately colored shroud, measuring 41 inches by 21 inches (104 centimeters by 53 centimeters), and 88 other textiles were donated to a museum in Gothenburg in the early 1930s by Swedish consul Sven Karell. He had secreted them out of Peru after they were discovered in the Paracas Peninsula, a desert south of Lima where the extremely dry climate helped protect the Alpaca wool fibers. Despite being some 2,000 years old, "it is perfectly preserved," said Krzysztof Makowski, a University of Warsaw archaeologist who has studied the shroud as a professor at the Catholic University of Peru. 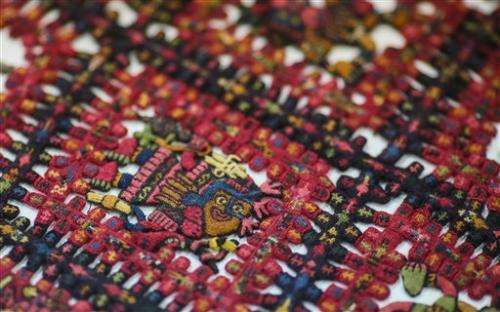 "Across the world, the discoveries of textiles of this age are much rarer than any precious metal." "If you wanted to find a Roman textile, you won't find anything because nothing was preserved," Makowski said. "Textiles are very fragile. There are very few countries in the world that have conserved fabrics. Peru is one of them." The so-called Shroud of Gothenburg is uniquely complex. It includes some 80 different color tones and subtones such as blue, green, yellow, red and orange. It is divided into 32 frames decorated with items resembling condors, frogs, cats, corn, cassava and human-like figures. Some researchers believe the shroud may be a sort of calendar related to the tracking of farming seasons, said Jahl Dulanto, an archaeologist at the University of Illinois at Urbana-Champaigne who leads the Paracas investigation team at the Catholic University of Peru. Dulanto said experts still do not fully understand how the shroud's creators achieved the combination of sewing techniques and pigments. 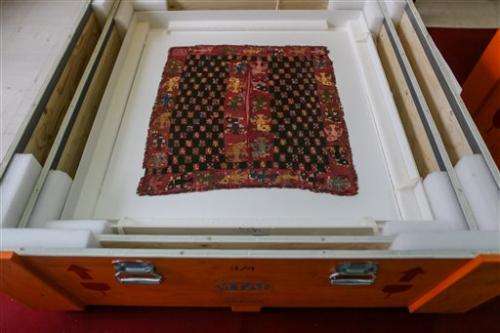 The shroud and three other pieces were flown to Peru last week, fulfilling a friendly agreement reached with the Museum of World Culture in Gothenburg in 2013. 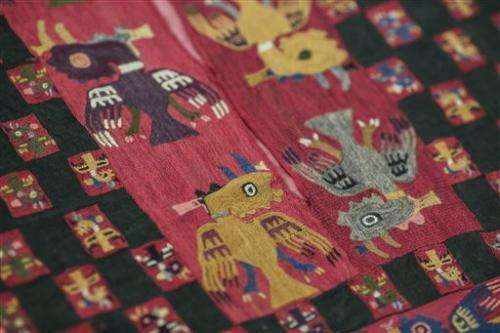 The rest of the Paracas textiles will return to Peru over the next seven years. Peruvian officials have been working to reclaim its cultural antiquities from other countries. In June, it recovered more than 3,800 pre-Incan items held in Argentina. In 2011, Yale University returned 366 pieces from the Incan city of Machu Picchu that it had held for more than a century. I hope that after these objects have been returned to Peru, they will consider lending some of them out to foreign museums. Obviously a nation should be able to control objects from its own heritage, but I also think amazing things like this should be shared with the rest of the world as well.